On the strength of record-breaking soccer attendances and the completion of an innovative plan to build a new, state-of-the-art soccer stadium, Cincinnati has been awarded a Major League Soccer expansion team, Commissioner Don Garber announced Tuesday to an enthusiastic audience wearing the club’s colors of orange and blue at Rhinegeist Brewery in Over-the-Rhine, a event that was telecast to an even larger crowd watching at Fountain Square downtown. The club will begin MLS play in the 2019 season. 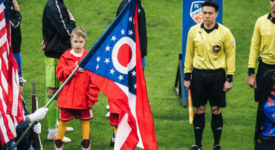 The local team, which will continue as FC Cincinnati when it joins MLS, plans to play at Nippert Stadium on the University of Cincinnati campus until 2021, when a new 21,000-seat soccer stadium at the site of Stargel Stadium at Taft Information Technology High School in Cincinnati’s West End neighborhood is completed. FCC owners agreed to construct a new high school stadium near the school. FC Cincinnati’s managing owner is Carl H. Lindner III, the co-CEO of Cincinnati-based American Financial Group, which owns Great American Insurance. Among Lindner’s partners are Scott Farmer, chairman and CEO of Cintas Corp., and George Joseph, president of Joseph Toyota and principal of local automobile dealerships in Greater Cincinnati. Since its first season in the USL in 2016, FC Cincinnati has set attendance records including three crowds of more than 30,000 fans during the club’s run to the semifinals of the 2017 Lamar Hunt U.S. Open Cup. During its first two USL seasons, the team has shattered league records for total attendance, average attendance and single-game attendance. In 2018, the club has surpassed 17,000 season tickets sold, and has averaged almost 24,500 fans per game to date. The club also recently finalized a partnership with Mercy Health, to become a team partner when it begins play next season in MLS. Cincinnati Mayor John Cranley proclaimed May 29, “Orange and Blue Day, recognizing the local club’s colors of blue and orange.